The Edinburgh Military Tattoo is without doubt one of the biggest tourist attractions in Scotland. It has been staged every year without fail since 1949, so it is fast approaching its sixtieth birthday. Staged on the esplanade of Edinburgh's spectacular castle, the castle incidentally is Britain's second most popular tourist attraction, it has hosted performers from over forty countries. Since 1949 it has been attended by over twelve million visitors, and the annual audience is around two hundred and seventeen thousand. Approximately 70 percent of each audience come from out with Scotland, and half of these are from oversees. It has been sold out for the last nine successive years, and around one hundred million people watch on television around the world. Well in a word because it is spectacular! Have a look at the video below to see what I mean. 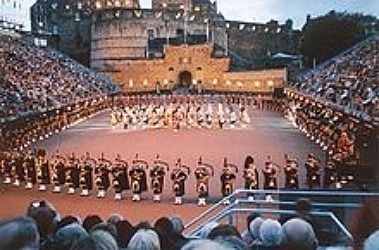 The 2009 Edinburgh Military Tattoo runs from 7th-29th August, and they are celebrating their 60th anniversary in spectacular style. They will be paying tribute to the 250th anniversary of the birth of Robert Burns (Scotland's National Bard). The international cast will include the world famous Massed Pipes and Drums, the Massed bands of the Royal Air Force, the band of the Royal Regiment of Scotland. Below there is a photo of the massed pipes and drums. As ever there will be the traditional haunting lament from the Lone Piper playing high up on the castle ramparts, also in their first ever appearance, the Central Band of the Swiss Army, along with Switzerland's Top Secret Drum Corps. The event is set up and run for charitable purposes, and over the years has donated some five million pounds to both service and civilian causes. It is an opportunity to see Scotland celebrating its strong culture, and at the same time extending its hand in friendship to many other cultures from across the world. And of course the massed Pipe Bands opening performance every evening will set your heart racing. I hope that this page has given you an insight into the Tattoo, and if you would like more information then please click here to find the official web site. And if you decide to join the audience I know you will have an experience you will never forget.